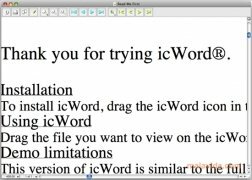 icWord is a tool that has been designed to allow any user to be able to view Microsoft Word, Microsoft Powepoint, AppleWorks and ClarisWorks files, without the original format of these files being affected, unlike what happens with other programs that have been developed for the same purpose. 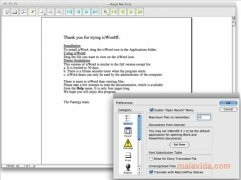 The program maintain the same font type and size, the style of each paragraph, the tables and the graphs that have been used, and the colors, as well as the page's style (margins, space between lines, text alignment,...). 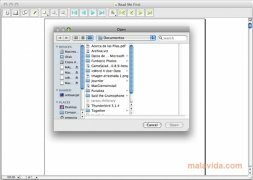 Once a file is open, you will have the possibility to rescale the text, search for words, extract fragments from any paragraph and browse through any document. 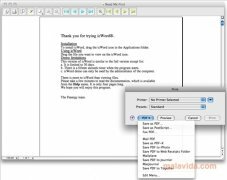 The graphic interface is very similar to the Preview application installed on Mac OS X, but with the great difference that it offers compatibility with versions 2, 4.0, 5.0, 5.1, 6, 7, 97, 98, 2000, 2001, XP and 2003 of Word. 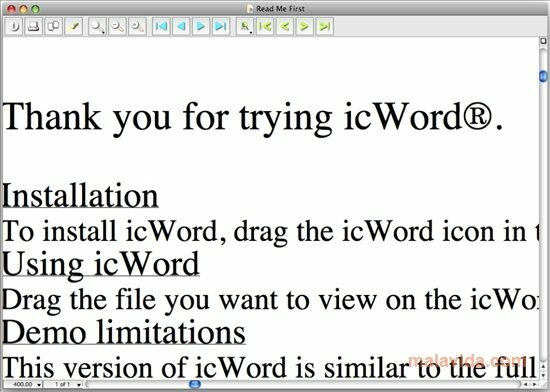 Have no more problems when it comes to viewing any text documents, thanks to icWord. The trial allows to use the application for 30 days free of charge.